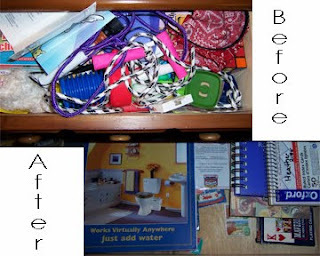 Well - Over at Organizing Junkie there was a challenge to tackle the drawers that are hiding all kinds of "disorganization" - This has been driving me CRAZY for quite a while...since my mom got sick and died things have been "accumulating". So I took the challenge and dove in and tackled 7 drawers and 3 cabinets. I didn't really have any containers to organize the drawers and cabinets but I think they turned out ok for now. Boy did I find some interesting stuff. 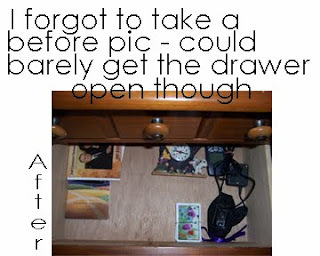 I forgot to take before and after pictures of "all" the drawers but I've got enough photos to show that I've been busy for a few hours this morning. 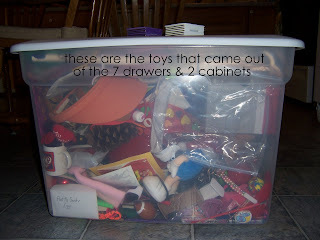 The little cabinet and 2 other drawers in the livingroom weren't photographed. Let's move to the kitchen for a bit. I have a buffet that has 3 drawers and 2 cabinets. Next to that we had all of Heather's school books and stuff. 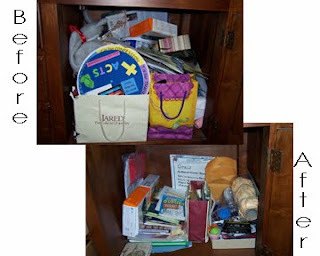 I've always thought that I should clean out the one side of the cabinet to put all of her school books in...when you homeschool, it seems like there are always books EVERYWHERE...ugh. 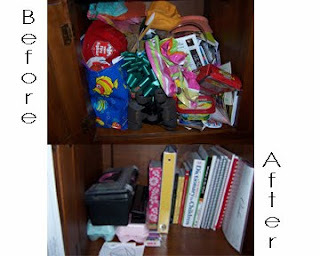 Well, take a look...I'm SO happy with the outcome and SO thankful to have happened over to the Organizing Junkies site! 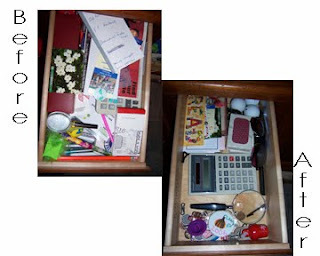 This is the "weird" part of my day...I am to the seventh drawer (pictured above) and pull everything out of it and this little thing falls, it's white and fat so I think it's bean that fell off of a craft project, pick it up to throw it in the trash and it starts to move...YIKES! 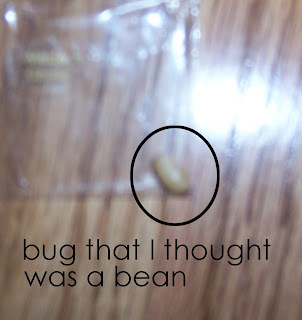 It has a brown pointed head...no legs - resembles some type of caterpillar to me...not sure WHAT it was doing there or WHERE it came from as we spray for bugs every 3 months...there was no candy in the cabinet but the cabinet IS solid wood...I didn't find any other "friends" either...we did have our caterpillars that we took care of until they turned into butterflies on this buffet this past spring...maybe that is where the little guy came from. And finally, our now completely unorganized bucket of toys...I'm hoping they go downstairs for a while and become forgotten about so they can find a new home somewhere else one day. For now, they'll remain in their container. 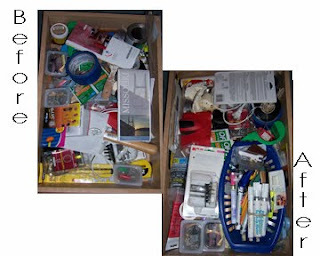 I do have 1 more drawer to get to "the junk drawer" - I think everyone has one of those that has tools, nails, etc in the kitchen - I'll have to organize that another day as it's time to get busy with "my part" of school. 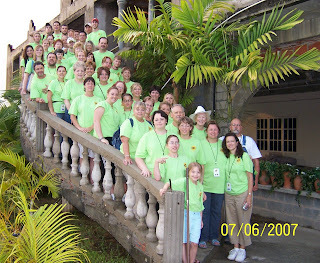 Thanks for stopping by...now it's YOUR turn...go clean out/up your drawers and tell us ALL about it by commenting here or over at The Organizing Junkies site...and don't forget to follow her "PROCESS". The final drawer in the kitchen...all of the drawers have been done!!! Woo Hoo!!! While I didn't have a good way to organize this drawer and I'm sure it doesn't LOOK like it's organized...at least now it is!! !